Humans are now vermin to be eradicated. As the City grows out beyond the orbit of the Moon, out beyond the asteroid belt, becoming a veritable Dyson Sphere, the scattered remnants of the human race are separated by ever widening gulfs of urban space. They develop cunning hacks to fool the City’s self-defence mechanism. They subsist on “slime” from the many supply pipes that ferry organic materials to the Builders, and they try to avoid the deadly Exterminators tasked with hunting all life. Blame! begins in darkness and shadows, its human protagonists dwarfed by the empty City that towers above them, the light so limited that everything seems like monochrome. Only the insides of their “helmettal” headgear show any vibrancy of colour, at least until an attack by Exterminators splashes bright sprays of blood on the gunmetal streets. And then Killy comes to the rescue, with a gun that breaks gravity. Blame! creator Tsutomu Nihei originally worked in construction – perhaps a fitting background for a man whose key work features an exponentially expanding city. His original draft of Blame! won a Kodansha manga competition in 1995, and eventually ran in comic form from 1997 to 2003. A prequel, Noise, answering several long-standing questions about his world-city, was also published in 2001. 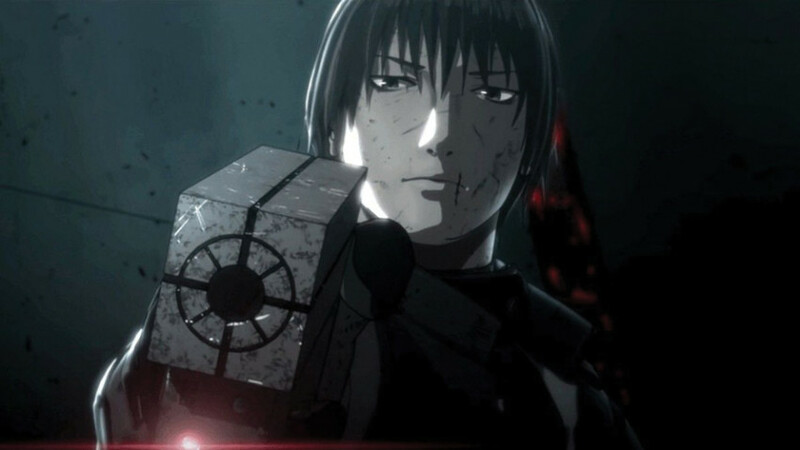 Since then, Nihei has become better known for a later series, Knights of Sidonia, although the long gestation of Blame! perhaps explains why the film version, released a generation after the manga ended in Japan, seems to have so many elements redolent of old-school cyberpunk and, yes, The Matrix. At least part of that time-lag, however, owes its existence to the tribulations of the anime industry. Announced in 2007 as a project in development, the Blame! movie struggled through the bankruptcies of two studios before it eventually landed at Polygon Pictures in time for Netflix money to make it happen. 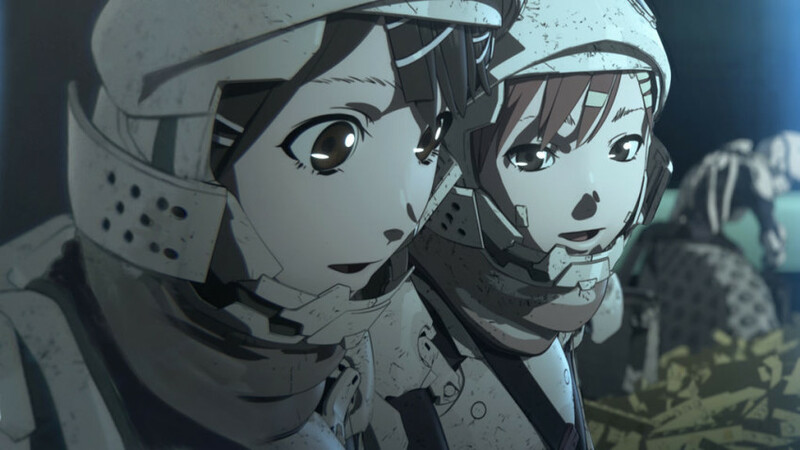 With a script from Perfect Blue’s Sadayuki Murai, it finally made it to market in 2017, more than twenty years after Tsutomu Nihei’s original pitch. Nihei’s imagination swings wildly between the extremes of big and small. Tiny groups of human survivors huddle in the ruins of their world, searching for generations for a mother lode of materials that can sustain their tribes. Cibo, the android scientist, waits for almost two thousand years (seventeen million hours, in her terms) for the chance to connect with the City’s information network for mere nanoseconds. And yet, such details are only revealed as asides in Hiroyuki Seshita’s movie version of the story, which concentrates on the activities of a tiny village of human survivors, and a moment in their lives when they are brought briefly face-to-face with the super-abundance of the City. After a lifetime of deprivation and squalor, they are confronted with the potential of an automated factory that can make anything they imagine – infinite food to fill their bellies, or infinite Exterminators to wipe them out. This is just a fragment of the fully-told story of Blame!, a tale that in its entirety spans several thousand years, and generations of conflict between humanity and “silicon life”, the machine civilisation inadvertently created by mankind. Killy sits at the centre of the story, a messiah figure for both races, a gunslinger on a seemingly endless quest, and the protagonist who is destined to find a solution, ultimately, for both of them. But in this movie version he is a quieter, solemn hero, a man cast in the mould of Shane or Mad Max of the Beyond Thunderdome era, constantly climbing stairways to the next level, in search of a human with the mythical Net Terminal Gene that will access the central computer and shut down the Exterminators and the endless building. It’s a wonderful thrill-ride, clearly designed as an advert and introduction to the ten-volume manga that spawned it, and deliberately leaving the viewer with more questions asked than answered. Six volumes of the manga are already out from Vertical, and romanise the hero’s name as the somewhat less laughable Kyrii. Because a guy with a gun called Killy is like a girl with a knife called Stabby. All right, Japan, that’s yours. Go ahead. Blame! is screening at Scotland Loves Anime, with a post-film Q&A from producer Jack Liang. 'Works of Mamoru Hosoda' Exhibition Opens Today!